A welcome rain in the Valley is slowing down a monstrous fire in the foothills. FRESNO COUNTY, Calif. (KFSN) -- A welcome rain in the Valley is slowing down a monstrous fire in the foothills. Fire crews say the Rough Fire is now 40 percent contained, after burning almost 140,000 acres of extremely dry grass, brush and timber. For the first time in weeks, firefighters are on the offensive side of this fire. Drought-fueled flames are simmering in places, allowing crews to finally take a breath. "Cooler temperatures have been huge. Not only does it help with the fatigue of the firefighters but also the fire behavior," said Capt. Brandon Vaccaro of Cal Fire. Scattered showers throughout Monday tempered erratic fire behavior, and fire crews directly tackled areas that weren't safe before the rains. "With this weather, we are all a lot more confident," said Vaccaro. From the skies, Neptune Aviation Services captured an aerial image of the smoke on Friday from 30,000 feet in the air. It's a stark difference from the ground level, where a layer of smoke is blanketing the mountains. These firefighters are now tasked with cleaning up charred ruins before the heat returns. "So hopefully within the next three days, we can get a good jump on what the fire is doing and actually get it pretty well locked into our control lines," said Vaccaro. Those control lines are built to stop the flames from leaping the perimeter surrounding the fire. On the west end, the main focus is to reinforce a line along McKenzie Ridge to keep the fire from heading toward foothill communities. Now, after an entire day of relief from treacherous weather, crews said the chances of the fire crossing the ridgeline is slim. Cal Fire crews said they're expecting cool and wet weather for the next two days. If they continue to make progress like Monday, they're expecting a larger containment number in the coming days. Total acreage increased to 139,133 acres and is currently the largest active fire in California. There are 3,741 personnel currently assigned to the Rough Fire. Containment remains 40%. Rough Fire Information: West Zone (925) 519-6303; South Zone (559) 332-2028 and (559) 549-4837; and North Zone (559) 842-6248. Air Quality Today: The smoke that has been impacting the foothill communities west of the fire should see clearing skies as the winds move up from the southwest and west today. This will shift the impacts to those areas immediately adjacent to the wildfire, and to the Owens Valley to the east and northeast of the incident. Mostly moderate impacts are anticipated due to the reduction in active burn areas, with a few areas of higher readings in close proximity. Overall, much improved conditions throughout the impact area. Sequoia National Park remains open and visitors can still use the Ash Mountain Entrance Station. Vehicles longer than 22 feet (including trailers) are not advised between Potwisha and Giant Forest Museum. Forest officials have been forced to close the Hume Lake Ranger District. This includes Forest Service managed land from the southeast side of Pine Flat Reservoir to the boundaries of Kings Canyon National Park, and the Eshom area north of Badger. A closure map can be found on the Sequoia National Forest website www.fs.usda.gov/sequoia/ This closure is expected to continue until the Rough Fire has been brought under control. Air Quality Tomorrow: Similar smoke conditions are forecast for the modeled area, with continued impacts to the Owens Valley. Weather Concerns: A weak disturbance off the coast will bring slightly increased cloud cover to the area. A gradual cooling trend will continue through Wednesday, with slowly rising relative humidity values. Fair relative humidity recovery tonight. Winds will remain terrain and diurnally driven. Inversion and thermal belt will form overnight, but not as strong as recent nights, trapping smoke. Highs in the upper 70s to near 90. Relative humidity values in the upper teens to lower 30s. The Fresno County Sheriff's Office and fire officials would like to clarify the guidelines of the current evacuation situation. 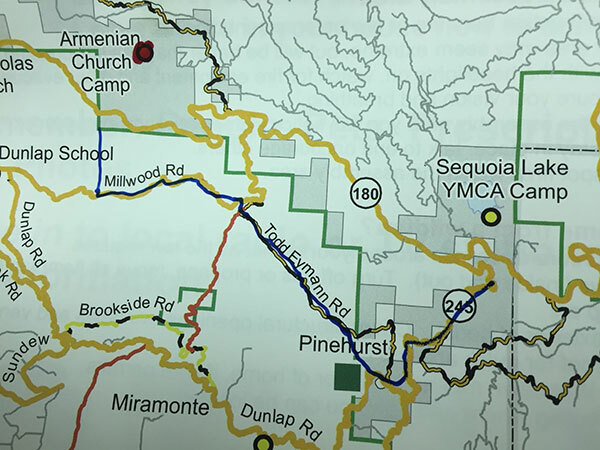 Residents who have a Dunlap, Miramonte, or Pinehurst zip code must understand they are considered to be in either a mandatory evacuation area or an evacuation warning area. - All properties on the north and south sides of Highway 180 east of the Highway 180/Dunlap Road junction. - All properties adjacent to the north side of Dunlap Road from the Highway 180/Dunlap Road junction to the Dunlap Road/Millwood Road Junction. - All properties on both sides of Millwood Road. - All properties on both sides of Todd Eymann Road from Millwood Road to Highway 245. - All properties on both sides of Highway 245 from Todd Eymann Road to Highway 180. - All properties on both sides of Dunlap Road from the Dunlap Road/Millwood Road junction east to the Dunlap Road/Highway 245 junction. An evacuation warning is defined as an alert to community members in an area of a potential threat to life and property from an emergency incident. An evacuation warning may be issued when the potential or actual threat to civilian life is more than 2 hours away. When a warning is issued, residents are being warned to prepare to leave their home. The Sheriff's Office tries to issue the advisory as early as possible based upon the fire's activity so residents will have time to remove their pets, livestock, large boats, RV's and any other personal effects in an orderly, unrushed manner. However, because a wildfire can be unpredictable, the time frame between an advisory and a mandatory evacuation can change quickly. You must be prepared to go at any time. A mandatory evacuation is declared when a wildfire directly threatens a community and residents are placed in danger. You must leave the area for you and your family's safety. Once you leave, you will not be allowed to return to your property until the mandatory evacuation is lifted. The Red Cross closed its evacuation shelter at the Sanger Community Center at 5 p.m. Sunday. Any evacuees needing disaster relief services can call the local Red Cross office at (559)455-1000 for assistance. Evacuation Map - Evacuations are along the blue line. Authorities are starting at Millwood Road and moving east.